Brian Falduto played an out, proud student in the 2003 movie musical, but his reality wasn't as joyous. In 2003, the film School of Rock hit theaters. In it, I played the memorable, sassy role of Billy, better known as Fancy Pants. As aware as I am that I likely wouldn’t make a list of D-list celebrities, it is interesting to note the impact that a role in just one movie has had on my coming of age. 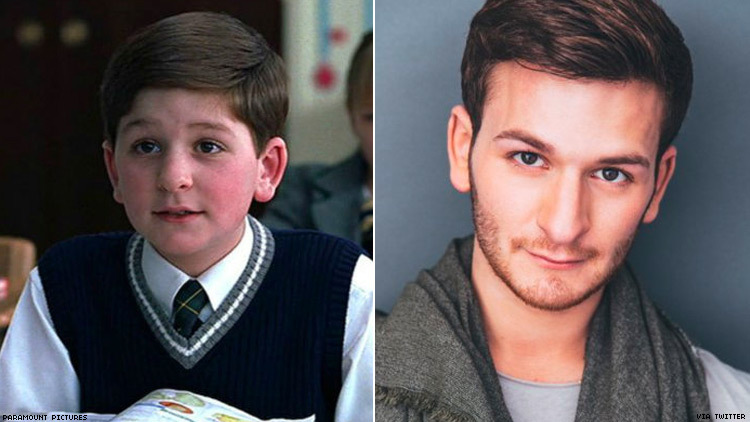 Nearly 15 years later, I am still the “gay kid from School of Rock,” but for the first time ever, I’m OK with it. Pushing this humbled experience of fame aside, I believe everyone has a unique and important story to tell. Here’s mine. Times were different when I was a kid. Believe it or not, in a private Catholic school in suburban New Jersey, it was not cool to be labeled gay. Not only was it uncool, being called gay was meant to be insulting. Because of my role in the film (as well as the way I carried myself, lesbi-honest), I was labeled gay. I didn’t know why my tendencies were considered wrong, but I just knew that I was meant to change. My voice was meant to drop, and I was meant to get a girl to go to the school dance with me. The former of which is still fluctuating day to day, frankly, but don’t worry — I had plenty of takers on the latter. No one in my life was taking the time to stop and tell me that it was OK to just be me. I was always expected to fit in even though I was most known for standing out. I don’t think anyone around me intentionally meant anything by this; they just wanted what was best for me. Not to mention the amount of LGBTQ-positive influences available to me was zero. I wasn’t even pointed in the direction of cultural items such as Will & Grace that might have been eye-opening for me. There also weren’t seasons of The Voice like the current one where sexually diverse and gender-fluid talents are represented or openly gay Olympic figure skaters like Adam Rippon. Throughout my entire life, I never had a single person who looked like someone I could become. Yet here I was being broadcast as a relatable image for so many people in my exact same situation. I feel it’s a bit of a shame that I couldn’t embrace myself sooner. I can’t help but feel like I would have been unstoppable. When I first auditioned for School of Rock, I didn’t give a damn what anyone thought about me. That’s why I got cast. I walked into that room with so much pizzazz that they literally created a role for me. Then from 2004 onward, I spent about 10 years building up reservations about myself. Often they didn’t even have to do with sexuality. I had shut down the idea that I could be gay so early on in my life that I eventually believed I wasn’t. But the damage was already done. My self-doubt was so ingrained in me that I was subject to everyone’s opinions all the time. Sure, everyone builds up self-esteem issues in middle school and high school. I don’t think I’ve had it harder than anybody else; it’s just been ... different. The added element of being a young gay figurehead when I didn’t have any personal role models to depend on, well, complicated things, to say the least. Eventually, I began to care so much what people thought of me that I couldn’t even audition well anymore. Acting became something I had to do to become successful so that I wasn’t known forever as just the “gay kid from School of Rock.” It was only toward the end of college that I started to find the fun in the craft again, the reason I fell in love with it in the first place. It was only then that I became capable of showcasing myself properly. Oddly enough, accepting my lane or my “type” or whatever you want to call it has been liberating and has allowed so many more opportunities to present themselves. I finally know what I’m bringing into the room or onto the stage, and I genuinely feel like it’s something worth contributing. But this didn’t happen overnight. There was something I had to experience first: love. I’ll never forget the day when my ex and I confessed our attraction to each other. I was a senior in college, he a sophomore. We had been developing an interesting bro-ship where we spent a lot of time together. One afternoon, he told me he was bisexual and that I was the only person he was telling. For two days I racked my brain: Why would he tell me that? We weren’t close enough that I should be his only confidant on this topic. Finally, I worked up the courage to ask him if I had anything to do with his confession, and he said yes — he was into me. Just like that, everything I had spent 10 years caring about was tossed into the lap of another individual, and it was terrifying. Unfortunately for me, the individual on the receiving end of all this was immature and even more misguided than I was in some ways. Turns out I wasn’t his only confidant or even his first gay relationship. After two years of toyed-with emotions, fights, and of course, stretches of bliss later, I walked away with a lot of self-discovery still ahead. It was an interesting roller coaster going from my most guarded self to my most vulnerable in a matter of seconds. I didn’t have time to process it all and instead was caught up in the tricky business of love. Despite everything I had been through when I was younger, there were times that this breakup became the hardest thing I’ve ever had to deal with. I was left heartbroken while he went on to date someone else only weeks after we ended. That was that: I had finally come out. But it didn't happen because I was proud of who I was; it happened because I fell in love — something I never thought was in the realm of possibility for me. When we broke up, I still felt a lot of shame. Not for being gay, but because who I was felt defined by bad relationship decisions. I felt weak when I was in the closet, but I felt weaker knowing I let someone untrustworthy take the driver’s seat in my life. Navigating adulthood as a single gay man was difficult after this whirlwind. I didn't feel ready for our generation’s merciless dating environment based on a suggestion that no one feels strongly about anyone or anything. Trading “straight and masculine” for “cool and carefree,” I was once again expected to be something I wasn’t, just like when I was younger. I needed to take a step back, take my time and find my true self. I had a lot of internal problems that needed solutions. Where did my quest for answers lead me? To music. Recently, I was working on an educational touring show that went around to public schools in New York City. I saw in the hallway of one school a poster on LGBT tolerance meant to begin inspiring open minds and self-acceptance at a young age. I couldn’t help but wonder how that would have affected me when I was in middle school. Times are changing; Kids are smarter, and there are successful LGBTQ artists, musicians, filmmakers, writers, athletes, and others shouting the fact that no one should be any less loved than anyone else. These ideals are finally being shoved in people’s faces, but jeez, so are some other horrible messages. It’s still illegal to be gay in 72 countries. There are still people ending their lives because they feel completely alienated and helpless over a ridiculous notion that they are doing something wrong by being who they are. In 2017, nearly 30 transgender people were killed in the U.S., most of them people of color. There’s more work to be done and that’s sort of what my song “Turn That Song Back On” is about. The track was on my debut acoustic EP Love One Another. Have you ever been enjoying a song and someone goes and skips to a different song? That’s how I’ve felt recently with the negative images that have been filling the news. Call me crazy but the world, or at least my New York bubble, had previously seemed to be headed in a progressive direction. Then hatred was unearthed in the world, and I feel like our song was shut off. I want it to play again because I’m still singing it. The world is hard enough! Why are we trying to get in the way of people’s happiness? Looking back, I am very content with my life, and I wouldn’t change anything. My struggles have helped me grow up to be humble and kind — two qualities I really admire in myself. All the versions of who I’ve been are buried inside me as I grow older, and the self-care that is required to sort through it all has been really rewarding. It’s brought me closer to myself as an artist. As a songwriter, I use lyrics to tell my story. It’s my favorite thing in the world to hear that someone relates to something I wrote. Overall, it’s been an eye-opening experience for me, learning that everyone is going through stuff and no one really has it all figured out. Maybe if we could all just be a little more honest and stop pretending, life would be simpler. Maybe by doing so, we can help others unlock the truth in themselves. My most recent (and honest) work is currently up on my YouTube channel. The “Live Performance Sessions” are essentially a series of music videos meant to give an insight into what it might be like to hear my songs live. At the bottom of each video is a fundraising link should you want to help me continue telling my story. Thank you and please love one another. BRIAN FALDUTO is an actor and musician. Follow him in Twitter @BrianFalduto.